This transmitter is embarked on this Proba-V mission. The equipment operates in the 8025–8400MHz frequency range. It exhibits a data rate up to 100Mbps. The RF output power is programmable from 30 to 39dBm (+40dBm in option) per 1dB step. The equipment is designed for missions of 5 years-lifetime at Low Earth Orbit (LEO). The transmitter includes a DC-DC converter having a galvanic isolation. The architecture of the power supplies is designed to be able to protect the transmitter against latch-up effects due to heavy ions in space: an electronic fuse has been placed just after the main DCDC converter and some current limitations were implemented for each individual function. A smart strategy is proposed for controlling the supplies of the internal power amplifier in order to get the best efficiency for each RF power level. 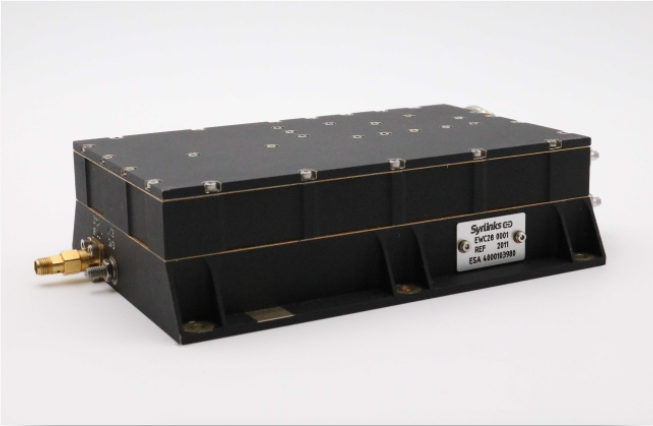 EWC28 XBT can be adapted for Deep Space, especially in terms of Frequency band, Bitrate, ... EWC28-DS has already been selected and commissioned for a lunar mission.